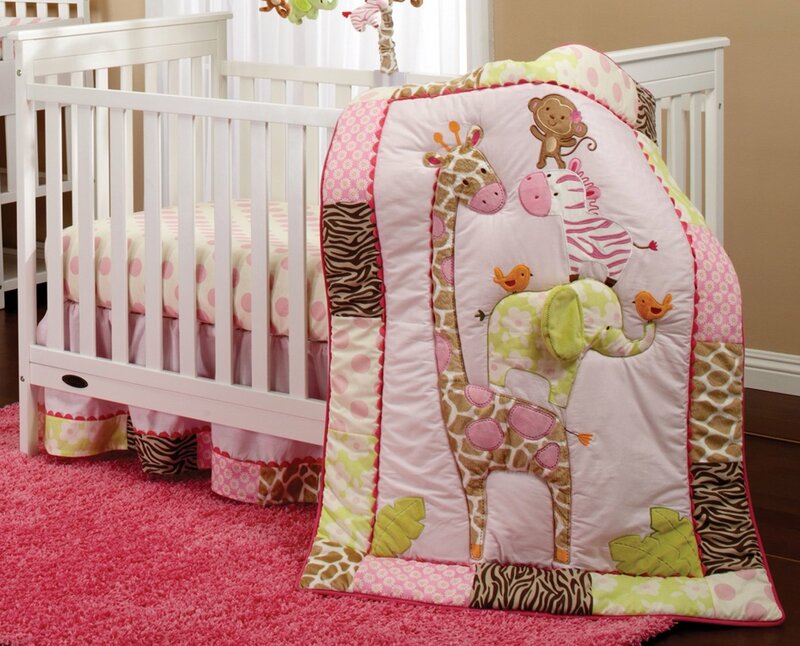 Carters Jungle Jill Crib Set Add to Flipboard Magazine. When I was pregnant with my first daughter, I was so excited to decorate her nursery. 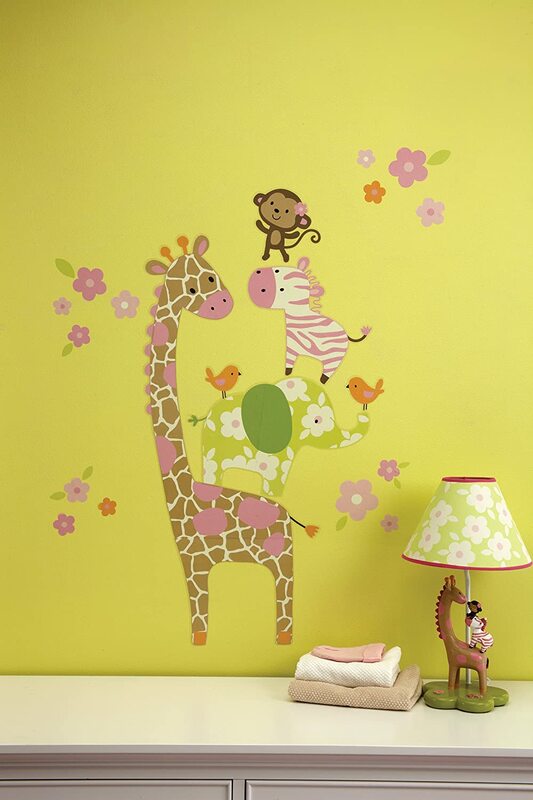 Carters was the best nursery bedding I knew of at that time, so I looked to them to help me decorate. I wanted pink, but not too much pink. I wanted her to be rough and tough like her big brother, with a touch of girlyness in her. Is that even a word? So I thought about using Carters pink bedding with animals on it. It was adorable and she loved it. We kept that decor till her baby sister came along and then I redecorated. This set really reminds me of the one I chose. I loved sitting in her nursery rocking her to sleep. 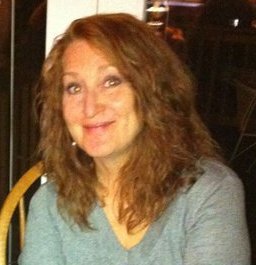 I would look at the animals and wonder what she was seeing and how it made her feel. It was a comfortable nursery and I am glad I went with Carters. Carters has been doing this for a long time. They are only designing just for babies and they don’t skip on the details. I love that they create accessory pieces that match. It just seemed to tie the room together. 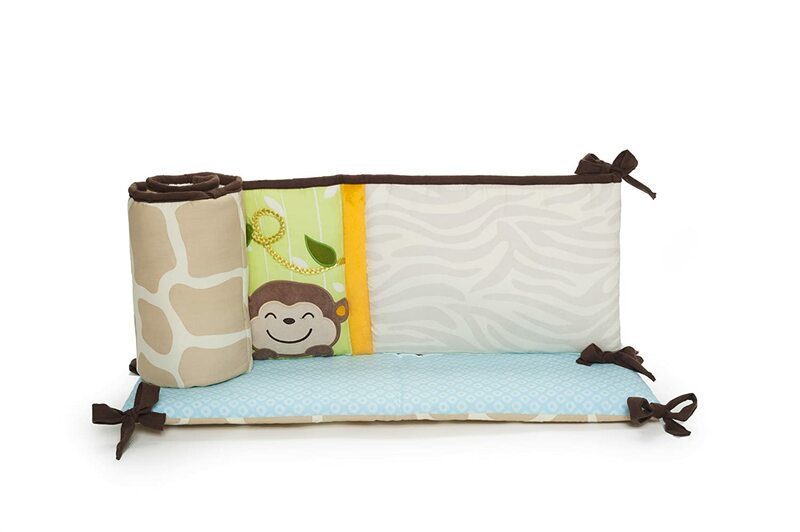 This great Carters set includes the quilt, diaper stacker, fitted crib sheet and dust ruffle. It is beautifully appliqued in multiple fabrics and textures. You won’t have to worry about this fading because it is designed to preserve its colors and gentle softness wash after wash. They are easy to get on the wall and just as easy to get down. Design your own little jungle with each piece, just the way you want. Only you know what will be perfect for your little girl. You are going to need some light in that new babies room. 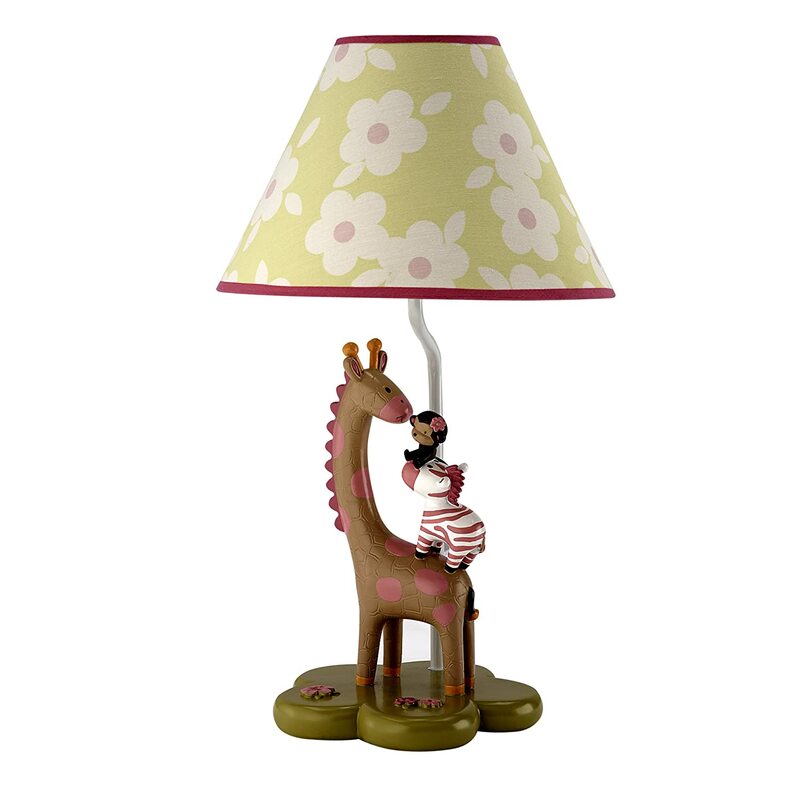 What do you think of this great lamp from Carters? Look at this happy trio that features a colorful green resin base with an attractive green and white floral shade trimmed in pink. A warm glow is generated by an energy efficient light bulb equivalent to 60 watts and features an on/off in-line switch on an approximately 46″ cord. You are going to need a laundry hamper just for your little girl. Carters has designed the perfect hamper. It has a removable mesh liner that will make it easy to keep it fresh and clean. When you aren’t using it, it folds up flat for easy storage. But believe me, you will be using it…a lot. Sooner than you think she will be looking around and you will want to have this matching mobile ready for her. 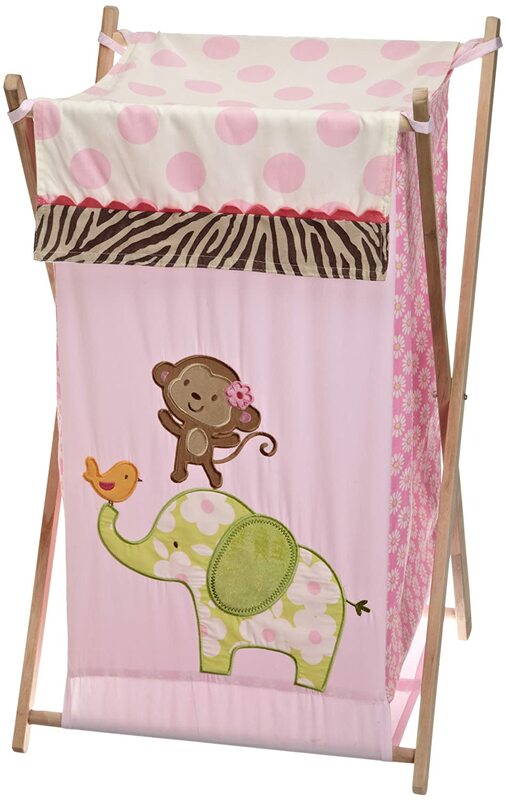 With a pleasant little peppermint colored zebra, plush green elephant, and two swinging monkeys dancing below a palm-frond umbrella your baby will love this Musical Mobile. 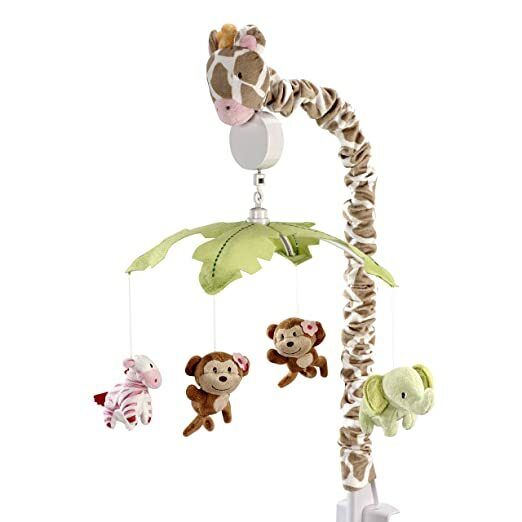 The mobile attaches to most cribs with an included universal mobile suspension arm creatively decorated as a long-necked giraffe which holds the gently turning mobile in his mouth. A plastic frame provides durability and easy to follow assembly instructions are included. I know there is some conversation as to whether you should use these or not, I am a firm believer in them. I used them with all three of my babies and they were fine. I like them because they roll around and hit their heads on the crib. I think it is a protection. There you have the Carter Jungle Jill set. Try adding items, like rugs or lamps in colors that coordinate with this set. Pink would be perfect.